This past Saturday marked the last day of the Great Bread Experiment – White Bread Edition. Four types of bread started out together: homemade (in the bread machine), baked “in-store” bread from the grocery store, artisan-baked bread from the farmers’ market, and the classic Wonder Bread, whose packaging boasts “Free of artificial preservatives”. 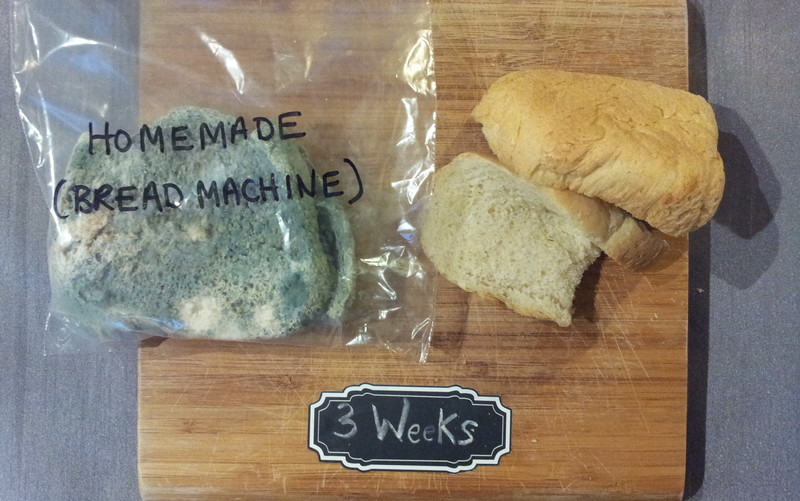 For three weeks they sat in plastic and paper bags at room temperature in my dining room, doing their bready thing. 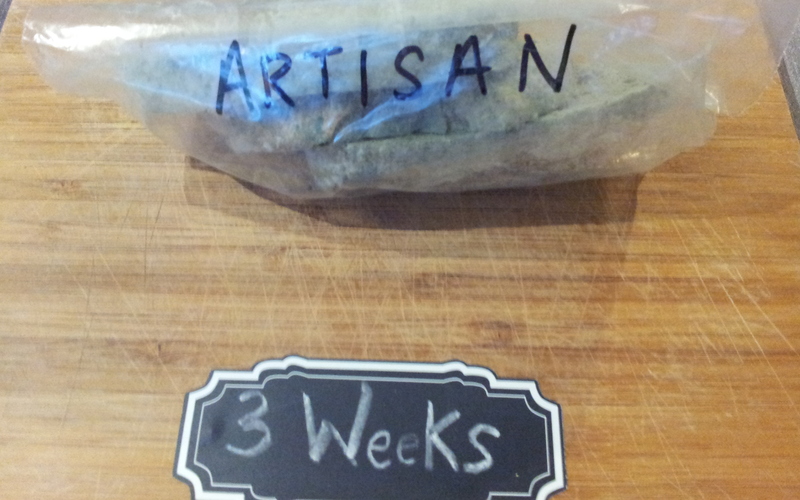 A week in, all four – preservatives or not – were mold-free. Between days 7 and 10 fuzzy blue mold took hold on all. By week 3, I probably should have worn a hazmat suit before taking the photos. Before reflecting on the results of this experiment, let’s take a brief foray into food science. To grow, mold and other microorganisms need a few things, namely a source of food and a source of water. Because paper bags let so much air through, there wasn’t enough moisture for mold to grow. But in plastic, moisture is sealed in and mold forms more quickly. 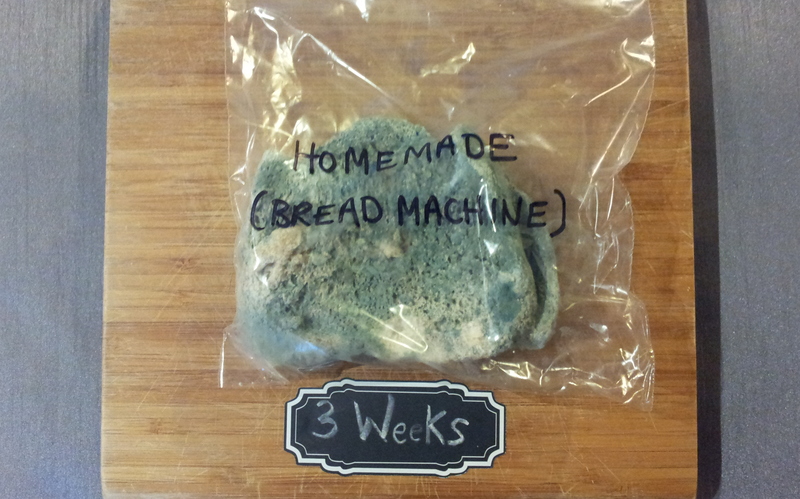 Wonder Bread “wins” this category, lasting 13 days without a spot of mold. 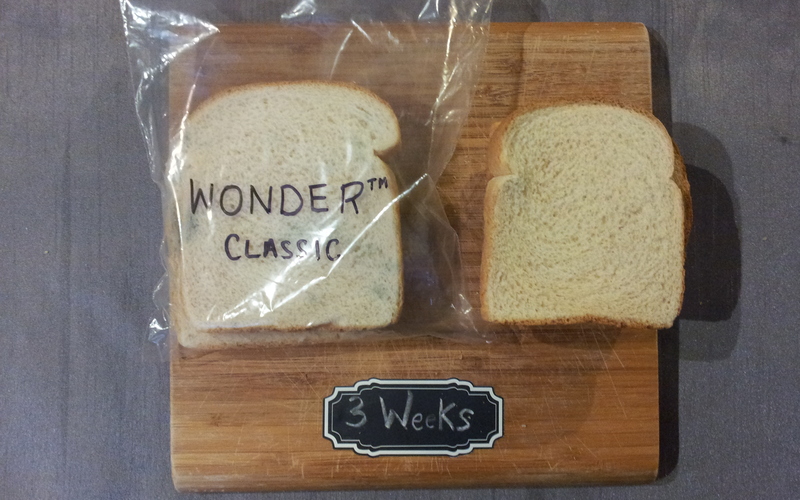 Even when the mold started, it hardly took hold – is there a mysterious reason Wonder Bread holds up the best? Perhaps because it’s baked in a sterile factory? Or is it irradiated or something? (Confession: I Googled this and if a poster in this forum thread is onto something, it’s the cultured wheat flour “food grade organic acids” that’s the culprit hero; not that I feel any better after reading that). 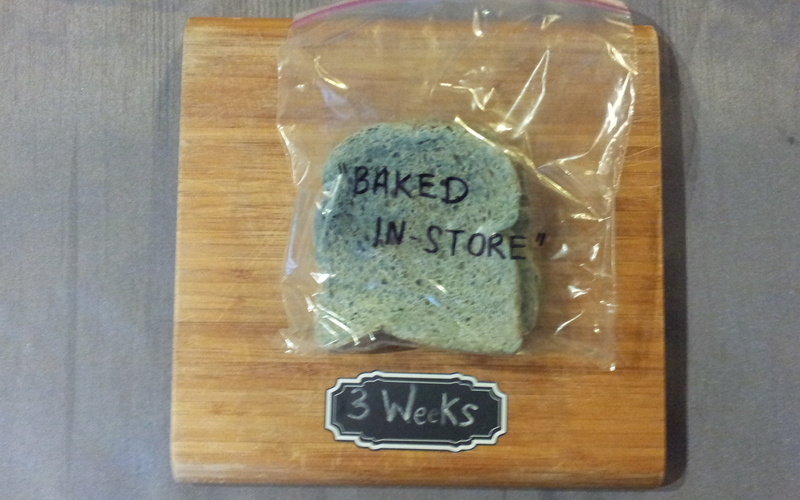 The weird part is that the baked “in-store” bread was the only loaf really loaded up with preservatives, but they didn’t really seem to help. It lasted a week, just like the Wonder bread and homemade bread. 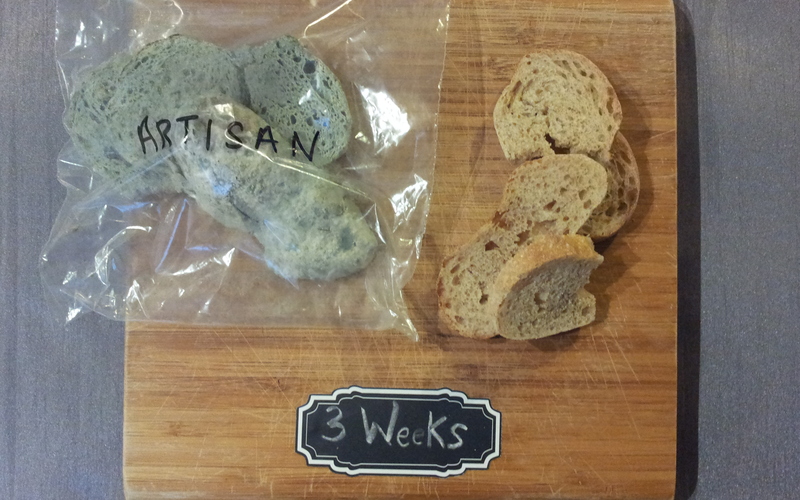 On the flip side, the artisan bread went moldy the fastest. By the time Wonder Bread sprouted its first green hair, the spores on the artisan bread had already passed go and were putting up hotels. Of course, the artisan bread has no preservatives, but that can’t be the whole story. Could it go “bad” so fast because it’s baked outside? Or with wild yeast? Or because it’s made by hand? Or could it be the organic flour? Doesn’t really matter; this one was my favourite to actually eat. 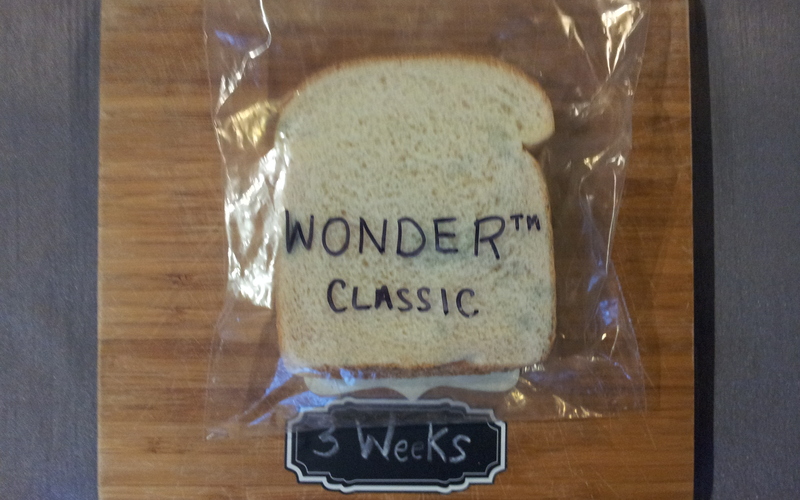 I’d buy and freeze over keeping Wonder Bread on my counter any day. The artisan bread was the most expensive, but at $4 a loaf it’s less than some of the hoity-toity loaves I lust after in downtown bake shop windows. The Wonder Bread and baked “in-store” bread were both $2. But mass-produced food is generally cheaper (*cough* and of lesser quality *cough*). Expect me to come back to this theme. Wonder Bread. Hands-down. It’s clearly maximized for a long plastic shelf life. Definitely not the artisan loaf. It dried up after 2 days. The rest were good for about 4 days. Not bad, really. Placed side-by-side, I was disappointed to see how quickly my fave organic loaf lost its lustre. In the “olden days” bread would have been made in similar conditions (by hand, outside, in a wood-fired oven), not in a sterile factory untouched by human hands (which was, at the time bread-making machinery was invented, quite desirable). I can see why preservatives changed the whole bread ball-game, especially in the summer when bread would go bad faster. You’d lose so much less to waste if you could stretch a loaf longer than a day or two, especially if you’re the type of person who can afford a diet more varied than bread and butter (in contrast to the stereotypical British peasants, who ate so much bread their ovens must have been on 24/7). At the same time, factory bread (and even homemade bread-machine bread) just isn’t as satisfying as bread with texture; substance; and a crust that differs from the inside of the loaf. I’d buy artisan bread and freeze half a loaf rather than succumb to Wonder. 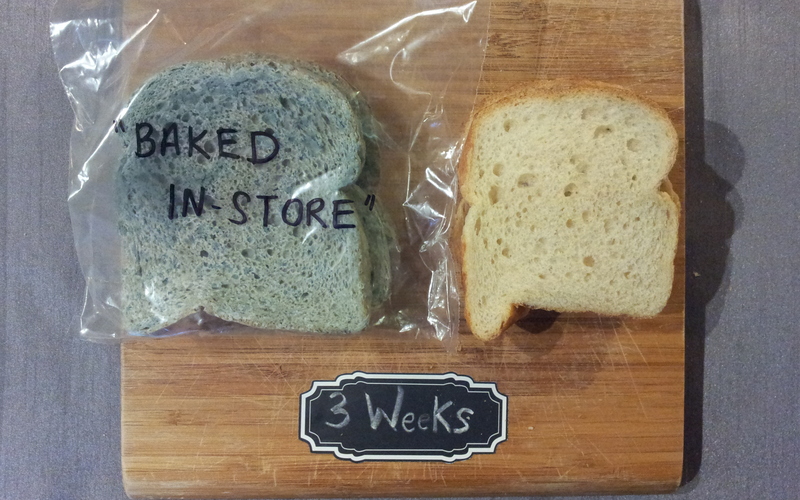 Cheap, factory-produced bread does seem to last longer, even if it doesn’t have preservatives. If you’re going to eat sponge-bread, at least choose one without preservatives.